A game played on a board of 8 columns and 8 rows. 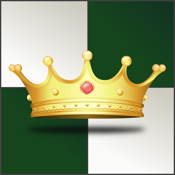 The goal is to get your King from your corner to your opponent's corner without being captured. This game is based on the rules of Chessers, a board game from 1960 that is no longer in print. * Universal App, both iPad and iPhone supported.